Phi Phi Relax Beach Resort is a rustic resort that sits within Koh Phi Phi Marine National Park on Phi Phi Island and is made up of 47 individually designed bungalows. 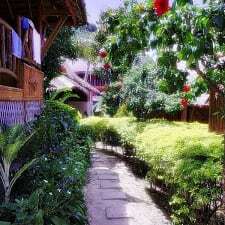 All bungalows at this resort are located either right on the beach or within a tropical garden. Rooms come with a private bathroom, a patio, a mosquito net, a coffee maker, a flashlight, and a hair dryer. Guests of this hotel will have access snorkel equipment, free Wi-Fi, kayaks, and massage services. It is possible to book a shark or fishing trip directly through the resort, as well. Food is available all day long at Relax Beachfront Restaurant. This restaurant specialices in Thai dishes and seafood, although European cuisine is also available. Diners can enjoy views of the Andaman Sea while eating. Phi Phi Relax Beach Resort is two kilometres from Camel Rock, 2.1 kilometres from Loh Lana Bay, and 2.5 kilometres from View Point Loh Bagao. As what some guests call the “best location on the island,” Phi Phi Relax Beach Resort is completely surrounded by nature. Guests love the various flora and fauna, as well as the beautiful views that are in abundance. Guests particularly note their appreciation of the secluded beach. Access to the beach is immediate from the hotel, giving guests ample opportunity to soak up the sun. Additionally, the hotel's beach bar gets high reviews as a fun place to gather, chat, and imbibe. The staff here receive commendations from the guests. They apparently are always up for doing their job, and doing it well. The level of professionalism is reportedly high, and everyone here comes off as pleasant and content. This location is only accessible by boat. While the seclusion can pay dividends in regards to lack of noise, enjoyable scenery, and other factors, guests do wish the boat ride to the location was shorter, and that it was easier to get back to town (as opposed to taking an approximately one hour trip). At times, some guests feel a little too isolated. This is not a location with good Wi-Fi Internet access. Guests at Phi Phi Relax Beach Resort warn of slow connection speeds and related frustrations. Guests also warn that at low tide, coral reefs can become exposed in the shallows of the beach, making swimming impossible during those periods of time. It's something you'll want to be wary of.